President Hosni Mubarak's power may have visibly crumbled before the world on Jan. 25 when protesters took to the streets of Cairo, but his personal wealth will likely be intact when he leaves office as pledged at the end of the year, or sooner if the crowds have their way. Experts say the wealth of the Mubarak family was built largely from military contracts during his days as an air force officer. He eventually diversified his investments through his family when he became president in 1981. The family's net worth ranges from $40 billion to $70 billion, by some estimates. Amaney Jamal, a political science professor at Princeton, said those estimates are comparable with the vast wealth of leaders in other Gulf countries. "The business ventures from his military and government service accumulated to his personal wealth," said Jamal. "There was a lot of corruption in this regime and stifling of public resources for personal gain." Mubarak, his wife and two sons were able to also accumulate wealth through a number of business partnerships with foreigners, said Christopher Davidson, professor of Middle East Politics at Durham University in England. He said Egyptian law requires that foreigners give a local business partner a 51 percent stake in most ventures. Aladdin Elaasar, author of "The Last Pharaoh: Mubarak and the Uncertain Future of Egypt in the Obama Age," said the Mubaraks own several residences in Egypt, some inherited from previous presidents and the monarchy, and others he has built. "He had a very lavish lifestyle with many homes around the country," said Elaasar, who estimates the family's wealth is between $50 billion to $70 billion. Gross national income is $2,070 per family in Egypt, according to the World Bank. About 20 percent of the population lives below the poverty line, according to a 2010 report by the CIA. "Gamal and Alaa are partners in the biggest trade and industrial companies in Egypt, practically paying nothing," Elaasar wrote in his book of Mubarak's two sons. Elaasar said the sons have shares in Chili's restaurants, Hyundai and Skoda auto dealerships, Vodafone, and several luxury hotel and residential properties. Mansour Amer, chairman of Amer Group Holdings and franchisee of 19 Chili's restaurants in Egypt, denied any relation to Mubarak's family. "We have nothing to do with any political figure," said Amer. "We are very well known in our community and we have no ties to them." Dina Ghabbour, chief strategic officer of GB Auto, owner of the Hyundai dealership in Cairo, said the Mubaraks do not own any shares in the company. The Mubarak family owns properties in London, Paris, Madrid, Dubai, Washington, D.C., New York and Frankfurt, according to a report from IHS Global Insight. Davidson said the family's net worth, however -- $17 billion for Mubarak, $10 billion for his second son, Gamal, and $40 billion for the family -- are really just estimates. "Of course, by definition, bank accounts in Switzerland are a secret so we cannot get a full picture," said Davidson. Robert Springborg, a professor at the Naval Postgraduate School and a Middle East scholar, said while the family is very wealthy, they have not been extremely overt with their wealth. "One of the sons has a nice apartment in Cairo but nothing hugely lavish," said Springborg. "There are many other people in Egypt who live a more lavish lifestyle than them." Whatever Mubarak's wealth is, Jamal said it is certain that whenever the president actually leaves office, there will be an investigation into his assets. "There's not much of a cover-up," she said. "The people have already outed him as a corrupt leader." 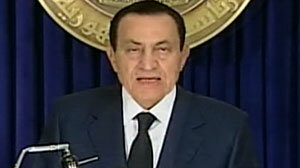 How Much Is Mubarak Worth?